Good morning! 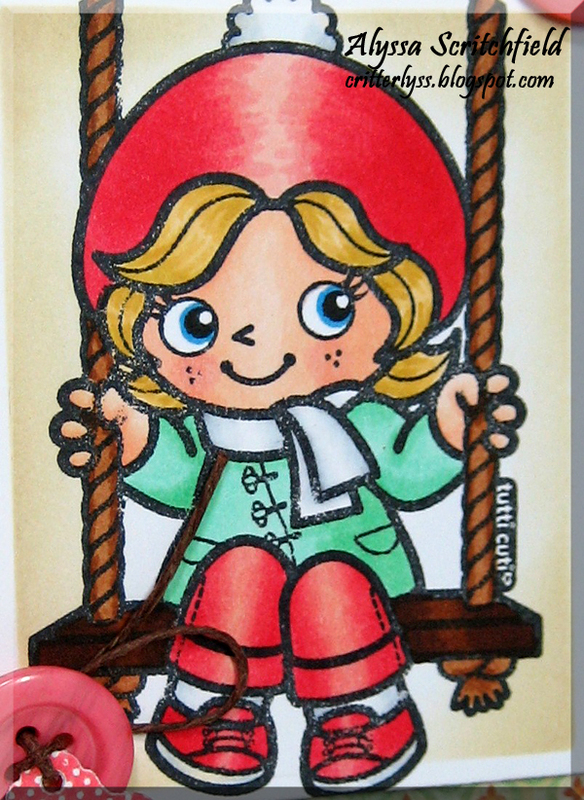 Alyssa here with a little Swinging Sweetie from a new line of stamps called Tutti Cuti. These deeply etched, red rubber stamps, come pre-cut on foam ready to slap on an acrylic block and stamp away! When I sat down to create this card, I had a totally different idea in my head. I was going to create a tree for her to be swinging from with baker's twine ropes on the swing and a blue sky/cloud background...after several attempts to get the tree just so, I gave up! lol I went and found a sketch to play with and came up with this little number. She is stamped with Memento Tuxedo Black ink and colored to coordinate, but not necessarily match, the dp. I visualized the light shining straight down on her which is why the highlights are on the center of her head and legs. I don’t know why, but I almost always have my light shining from the upper right…maybe because I’m right handed…I don’t know. iCopic carries a book that is very helpful in determining your light source and how you would shade your image called Shadows & Shading: A Beginner’s Guide to Lighting Placement by the Copic Queen, Marianne Walker. It’s a great little book that even comes with 4 clear guides to lay over your image to help you visualize the shadows more. I highly recommend it! This is so cute Alyssa!! Your whole layout is amazing and your Tutti Cuti is precious! Positively precious! Love the papers with her and especially that fabby tag!